Lieutenant Colonel William F. Buckley was born in Medford, Massachusetts on May 30, 1928. Colonel Buckley graduated from high school in 1947 and joined the United States Army. Following two years of service as an enlisted MP he attended Officers Candidate School and was commissioned a Second Lieutenant in Armor. He later attended the Engineer Officer's Course at Fort Belvoir, Virginia, the Advanced Armor Officer's Course at Fort Knox, Kentucky, and the Intelligence School at Oberammergau, Germany. Colonel Buckley served with the 1st Cavalry Division as a company commander during the Korean War. After the war he completed his studies and graduated from Boston University with a degree in Political Science. He was employed as a librarian in the Concord, Winchester and Lexington public libraries. In 1960, Bill joined the 320th Special Forces Detachment which became the 11th Special Forces Group and attended both Basic Airborne and the Special Forces Officers Course. He was assigned as an A- Detachment Commander and later as a B-Detachment Commander. 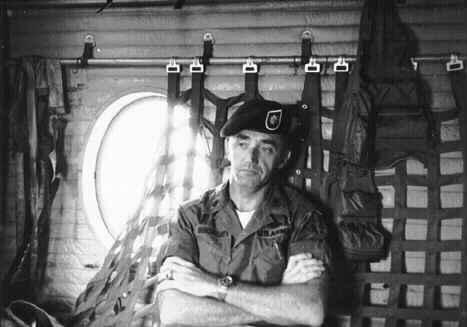 Colonel Buckley served in Vietnam with MACV as a Senior Advisor to the ARVN. He was promoted to Lieutenant Colonel in May 1969. Buckley was employed by the Central Intelligence Agency (CIA) from 1955 to 1957 and again from 1965 until his untimely death. He served in many varied assignments all over the world. He was taken hostage from his last assignment in Beirut; Lebanon where he was the Political Officer/ Station Chief at the U.S. Embassy. Colonel Buckley died after 15 months in captivity of illness and torture. His body was returned to the United States on December 28, 1991 and he was buried in Arlington National Cemetery with full military honors. Among Colonel Buckley's Army awards are the Silver Star, Soldier's Medal, Bronze Star with "V", two Purple Hearts, Meritorious Service Medal, Combat Infantry Badge, and the Parachutist Badge. He also received the Vietnam Cross of Gallantry w/ Bronze Star from ARVN. Among his CIA awards are the Intelligence Star, Exceptional Service Medallion and Distinguished Intelligence Cross. Among his civilian awards are the Freedom Foundation Award for Lexington Green Diorama, Collegium and Academy of Distinguished Alumni - Boston University. A memorial park - The William F. Buckley Memorial Park in Stoneham, Massachusetts, is dedicated to his memory. Colonel Buckley was single and left two sisters, Maureen Moroney, Joyce Wing and a longtime close friend, Beverly Surette. Human remains identified as those of William F. Buckley, chief officer for CIA in Lebanon when was taken hostage in March 1984, were flown to the US this evening for funeral services. He died in captivity, apparently after torture, the next year. A spokesman for the CIA, which seldom acknowledges identity of clandestine operatives, dead or alive, said he "was the senior agency representative in Beirut" when was kidnapped by organization calling itself Islamic Holy War. The agency also issued a brief biographical profile of him, again an unusual step for CIA in dealing with members of its clandestine service, but also reflecting the agony felt in the highest ranks of the intelligence service over the loss of one of its own. The CIA acknowledged his death in an agency memorial service, August 1987, nearly 2 years after Islamic Holy War boasted of having killed him. The spokesman also noted that agency honored him with a star carved in the marble memorial wall of the CIA's main building in Langley, Virginia, where officers killed on duty are commemorated. "It is star 51 of 54 stars," he said. "We are waiting for final positive identification by US authorities" at Dover Air Force Base in Delaware on Saturday, a spokesman said, noting preliminary identification was made early today by Lebanon's chief pathologist, Dr. Ahmed Harati, who issued his finding after examining a skull and some bones that were found wrapped in blankets early today on a roadside near Beirut airport. It is routine practice for US military forensic specialists at Dover to conduct their own examinations of remains of US officials killed in foreign lands, spokesman said. The same was done for Lieuenant Colonel William R. Higgins, USMC, another Beirut hostage slain by Islamic militants, whose body was returned to this country this week. Unlike Buckley, who arrived in Beirut in 1983 under cover of State Department posting as political officer of US Embassy, Higgins was serving openly as chief of UN observation team in Lebanon when seized. CIA official and a Pentagon spokesman said plans were underway for joint funeral service for them at Andrews Air Force Base, just outside the capital, on Monday. Remains of Higgins will then be buried at Marine base in Quantico, Virginia. There is already gravesite and stone for Buckley at Arlington National Cemetery where many of nation's heroes are buried. Buckley, who was a Lieutenant Colonel in the Army Reserve, won the Silver Star for gallantry while serving in Vietnam. A public memorial service was held with full military honors at Arlington on May 13, 1988, just short of 3 years after his presumed death. At the service, attended by more than 100 colleagues and friends, the Director of the CIA, William H. Webster, eulogized Buckley saying, "Bill's success in collecting information in situations of incredible danger was exceptional, even remarkable." Among the mourners was Buckley's longtime companion, Candace Hammond of Farmer, North Carolina, whom he left behind when he moved to Beirut. By the time of that service, some details of his previous life had become public: he had served in clandestine CIA assignments in Syria and Pakistan and that fate had become intertwined with President Reagan's impassioned efforts to gain release of other Americans held hostage in Lebanon. Well before US policy makers were certain that he was dead at age 57, the Director of CIA, William J. Casey, began efforts aimed at finding and possibly rescuing Buckley. At one point, an FBI team specializing in kidnapping cases was brought in. When the Reagan Administration accepted the fact of Buckley's death, hostage takers in Lebanon were believed to be holding 5 other Americans. In late 1985, Reagan made the release of these Americans a principal policy objective of his Administration, leading him and a handful of aides into a series of covert operations involving sale of sophisticated weapons to Iran by way of Israel and other incentives intended to ransom the captives. These operations culminated in what became known as Iran-Contra Affair in 1986. According to the biographical information distributed by fax today by CIA, Buckley was "an avid reader of politics and history" and "a collector and builder of miniature soldiers." Latter hobby enabled him to become principal artisan in the creation of a panorama at the Lexington Battlefield Tourist Center near his native Bedford, Massachusetts. The press release also said he owned an antique shop and was an amateur artist and a collector of fine art. It called him "a very private and discreet individual." The CIA awarded him an Intelligence Star, an Exceptional Service Medallion and a Distinguished Intelligence Cross, but did not say whether any of these were issued posthumously. He was a bachelor, and is survived by 2 sisters. May 30, 1928-June 3, 1985. He is buried in Section 59 of Arlington National Cemetery.